At the beginning of this year three of our Robins travelled to northern Greece in order to help combat the severe crisis of the refugees who are stranded there. Since the shutdown of the Balkan Route in March 2016 some 10,000 refugees have found themselves in the region around Thessaloniki in an unknown number of official and unofficial refugee-camps. These camps house survivors from Syria, Iraq, and Afghanistan, and other countries. Amongst these number many children and young people. Due to the hard winter we decided to travel to the region and to merge with other organisations on location. The first point of call was the English NGO, Help Refugees. This organisation, based in a disused warehouse near Thessaloniki, takes charge of providing food, clothing, and also medical care and the construction of accommodation for over 20 camps, so far housing 16,000 refugees. In order to find the most meaningful ways to invest the donations we had gathered, we took on a variety of tasks at the warehouse over the course of several weeks, and thus gained a deeper knowledge of the structures of refugee aid in northern Greece and also an insight into how hopelessly overstretched the governmental institutions are that are dealing with the challenging situation. It rapidly became clear that many projects gratefully accepted the flexible support of the Robins, as we were a mobile and efficient team. It thus became possible for us to initiate several long-term projects, with the help of both our bodily and financial support. Soul Food Kitchen:a Slovenian organisation that prepares and distributes several hundred meals a day for the Softex Camp by Thessaloniki, as well as for homeless people in the streets of the city. Help Refugees: The expansion of the warehouse complex’s outdoors area, to offer extended space for the NGOs from all over the world that gather around the warehouse, as well as the funding of a Dignified Distribution Shop. This consists of clothes shops that are set up in the camps. This measure hopes to restore small-scale consumer decisions to the residents of the camp. On the basis of a points-system, that functions like a bank-balance, the can ‘go shopping‘ for groceries and clothes, and thus regain this modest form of freedom, which a refugee, dependent on donations, so often lacks. Instead of simply having clothes and groceries distributed to them, the residents are thus able to take a step towards regaining their independence. 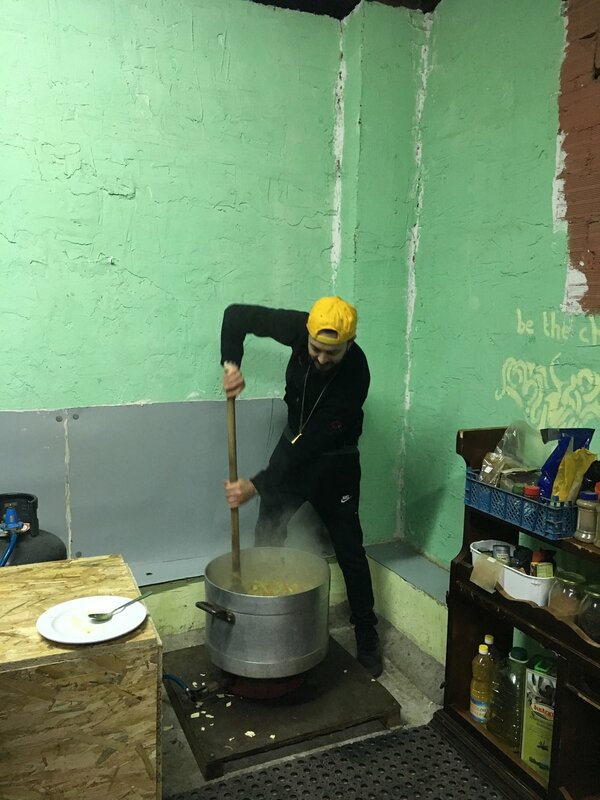 Soul Welders: Due to the severe need of the refugees stuck in Serbia in icy temperatures, we were able to give financial support to the organisation that was called into being especially for this purpose. The donations were invested in the construction and installation of kilns, which enabled those surviving outside to warm themselves without being continuously exposed to poisonous smoke. Refugee Support: In the military camp in Alexandreia we spent two weeks equipping classrooms and structuring and implementing English lessons for the adult residents. We did this together with the organisation ‘Refugee Support‘, which takes care of all aspects of the day-to-day life of the camp residents there. Since then the school has expanded so far that children are also able to drop in for Arabic lessons in the morning, and anybody interested can try German lessons in theafternoon. We are still in contact with the management of the school, and are planning a renewed collaboration with them this summer. Some impressions of our stay.